A survey of recent history reveals a gloomy picture: an ongoing series of conflicts, wars and general turmoil. As a result of all this, the human emotional landscape has become littered with angry, bitter and vengeful feelings. The modern justice system, preoccupied as it is with finding and proving guilt, does little to remedy this tragic situation. However, many individuals and groups are seeking ways to break the never-ending cycle of recrimination. When faced with the question of what we can do to change and improve the world, one of the most radical and challenging answers is to learn to begin forgiving others for what they have done to us. In this powerful and moving book, Prokofieff shows how the forces which lead to forgiveness can be consciously and freely developed. Without preaching a morality of forgiveness, he sets before us the spiritual facts which speak for themselves. From Tsarist Russia to the concentration camps of Nazi Germany, to the battles taking place in the early history of the Anthroposophical Society, the author gives striking examples of people who have been able to forgive often terrible crimes. 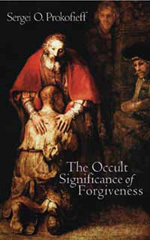 He provides multilayered analysis, pointing to the beneficial consequences of every single act of forgiveness. As he develops his theme, the importance of forgiving, not simply for personal salvation, but for the furtherance of humanity's evolution, is revealed in all its healing truth. SERGEI O. PROKOFIEFF was born in Moscow in 1954, and studied painting and art history at the Moscow School of Art. He encountered anthroposophy in his youth, and soon made the decision to devote his life to it. For years he has been active as a lecturer and author, and since Easter 2001 has been a member of the Executive Council of the General Anthroposophical Society in Dornach. Over a dozen of his books have appeared in English, including his latest, May Human Beings Hear It!